Here are 5 things you need to know to protect yourself! 1. If a price sounds too good to be true, it probably is! It costs money to clean carpets. Quality carpet cleaning detergents, carpet protectant, gas & time are all things that cost money for a carpet cleaning company. When you read things that say we’ll clean your carpets for $9.95 a room or your whole house for $69.00, these are most likely rip offs! 2. If the price is cheap, you get what you pay for! If a company really is as cheap as they claim to be, you have to wonder where they are skimping on costs. Some carpet cleaners have been known to clean with just water instead of adding solution! Others have been known to simply use a pre-spray and when the home-owner isn’t looking, they simply agitate the carpet & never steam clean. 3. You cannot put carpet protectant in your cleaning solution. This is a common tactic. Many cleaners will claim to put Teflon into the cleaner so that it “protects while they clean”. These cleaners either don’t know what they are doing, or they are deliberately cheating you. You cannot do both at the same time & Teflon carpet protectant is not a cheap service that they give away for free. 4. Price should be estimated by the square foot. 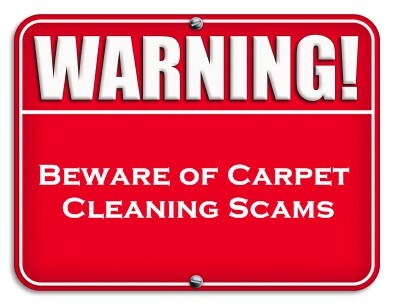 Many carpet cleaners will give you prices for the whole home over the phone. They do this because these prices are typically low & once the cleaner comes to your house they tell you that the price quoted was only for 2 rooms or your rooms are too big. An honest carpet cleaner will get the sq. footage in advance and quote you an accurate price before they come to your home. 5. Another common practice is to overcharge by deep cleaning areas that don’t need to be cleaned. A carpet cleaner who is interested in saving you the most money will evaluate your carpet, tell you what you can expect in advance & then do as they say they will do! Bait and Switch Carpet Cleaners!